It’s a crisis waiting to happen according to those in the know, but like the patients they work on — ambulance services and counties across the country are trying to save the emergency services system. The issue? A rapidly decreasing pool of paramedics throughout the state. Boyd points to a disheartening statistic, three years ago roughly 1,200 paramedics were trained in Michigan. Last year that number dropped to around 250. The question quickly becomes: Who is going to help when a 9-1-1 call goes out to someone who’s been in a crash, shot, or suffers a heart attack. In Livingston County they’re trying something new, inside their new headquarters they’re running a paramedic class that trains EMTs to take the next step. 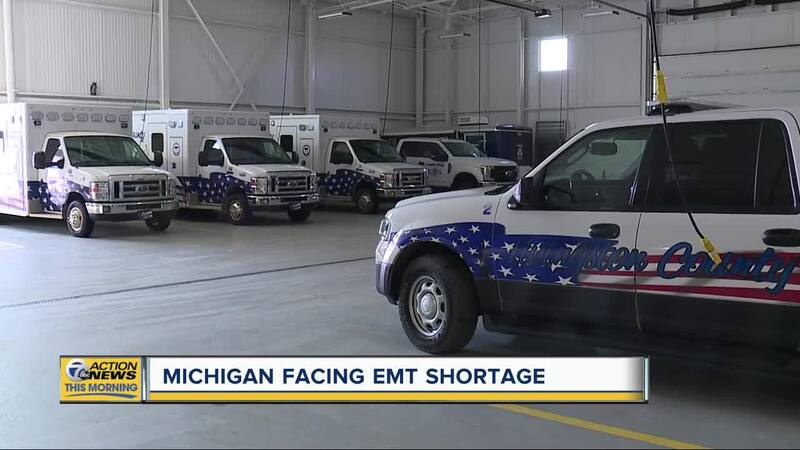 In Michigan a lot of ambulances run trucks with an EMT that’s paired with a paramedic, so ensuring they have at least one per truck is important. The training doesn’t stop there, though. They’ve also started programs in all five high schools throughout the county that allows high schoolers to take classes to learn how to be an EMT, once they graduate they’re one test away from being job-ready. That’s important because while getting paramedics in the doors is essential, retaining them is getting harder too. Boyd told 7 Action News that the economy is putting a pinch on them like other businesses. There is a hope that by training high schoolers to be prepared to walk in the door as EMTs will help part of the problem, once they’re in the doors he can pay half the cost it takes them to become a paramedic, on-the-job training that he hopes will lead to some retention. According to the Michigan Department of Health and Human services, the average salary for an EMT in Michigan is $30,000 a year. A paramedic averages around $39,000 a year, a position that requires roughly 21 months of training to take the step up from EMT. While Boyd noted a number of new hires they’re still looking for more EMTs and paramedics, you can find available jobs for both EMTs and paramedics online. The state also has details on training programs around the state that can prepare you for jobs that are currently in high-demand.